Have you ever pondered the Christmas story, especially the visit by the Magi? Did you wonder why they brought such interesting gifts to a baby … gifts that seem a bit unusual to us? I have read the Christmas story dozens and dozens of times. Even my 5-year-old can quickly share the info that the wisemen brought gifts of Gold, Frankincense, and Myrrh! But what were Mary and Joseph to do with such gifts? If the Gold brought was truly money, that is kind of an obvious answer. However, for many people today, especially if you don’t have Middle Eastern roots, the uses for Frankincense and Myrrh may be less obvious! In the spirit of the season, I thought I’d help you appreciate these gifts a bit more! Frankincense is a very valuable and useful essential oil distilled from resin; it comes from the trees in the Middle East, harvested from trees that are at least 40 years old (a biblical generation!) Frankincense is considered a “holy anointing oil” and was most likely the oil used when the Bible speaks of “incense.” As an anointing oil for kings, it was very symbolic to be included in the Magi’s gift to Christ! One of the farms where we get our frankincense! Frankincense is also mentioned in the ancient medical record Ebers Papyrus, dating from the 16th century BC, and it was valued more than gold! It is obvious then, that a poor common carpenter like Joseph would certainly not have had access to such a valuable treasure! Frankincense (Boswellia carterii) differs slightly from Sacred Frankincense (Boswellia sacra), and while both are valuable and wonderfully useful, historians believe it may be the more rare Sacred Frankincense that was the gift given to the Christ child. Regardless of which frankincense was given to Jesus, the benefits are similar and amazing to experience! Frankincense helps to support healthy skin and clear infections and contains many relaxing and calming properties. Do you remember what happened shortly after Mary and Joseph received this gift? They had to flee to Egypt in the middle of the night as Jesus’ life was in danger! Can you imagine the stress, anxiety, and worry that would have flooded their hearts and minds? What a comfort to utilize this resin … and have the Creator with them too! Do you use frankincense in your home? We like to apply it to our skin in the morning or our brain stems at night to increase the oxygen flow to our brains. The other gift brought to the Baby was Myrrh. Myrrh is fantastic for skin (it’s what Queen Esther used for six months before being crowned Queen and praised for her beauty!). Myrrh was also referenced in the Ebers Papyrus, and it was commonly used to support healthy skin and is known for being a powerful antioxidant, among other benefits! Myrrh is quite high in sesquiterpenes which stimulate the memory and emotional centers of the brain; it’s also very uplifting and would be a helpful stabilizer as Mary and Joseph dealt with the unknown factors involved with fleeing a country at night! Mary would have known how to apply the myrrh on Jesus to protect his little body, while using the oil on herself too for stretch marks and other skin issues of her own. No aromatic oil is referenced more in the Bible than myrrh! Myrrh is mentioned often in the Song of Solomon, as well as used in the holy incense blends in the tabernacle (Ex 30:34; myrrh is listed by another name of “stacte”). And there are over 130 references to the holy incense and anointing oils containing the myrrh in the Old Testament alone! Interestingly, myrrh is the only oil that is in both the incense and the anointing oil blend…and myrrh is known for being a “fixative,” in that it was added to oil blends to help the oils extend their fragrance (showing that God is the ultimate aromatherapist!). 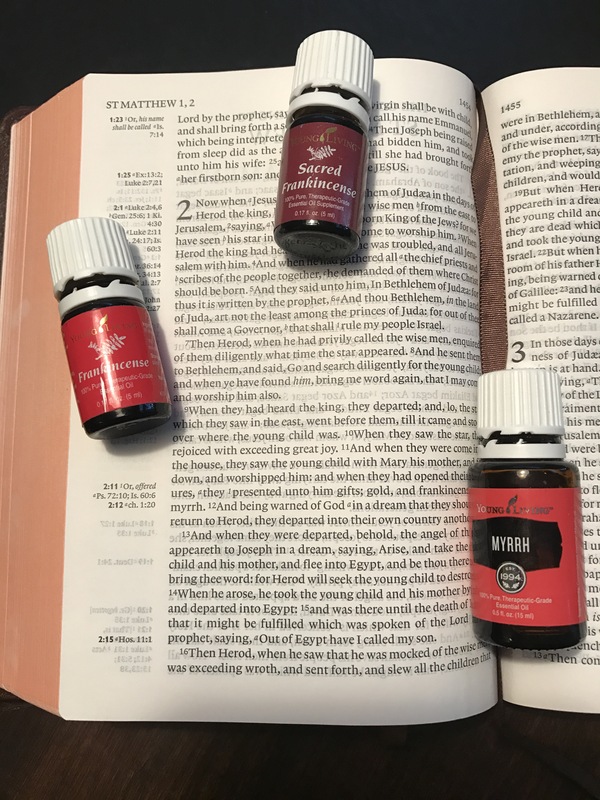 While myrrh was one of the first essential oils that Jesus would have received, it was also one of the last. When Jesus was offered a drink on the cross, it would have contained wine and myrrh; the myrrh was thought to make the wine less likely to cause inebriation. After Christ’s death, Nicodemus and Joseph of Arimethea came to prepare His body for burial and brought roughly 75-100 pounds of sandalwood (aloes) and myrrh oils. that would be worth over $150,000 in today’s market! This shows just how much they loved Jesus (and how wealthy they were!) to give such an enormous and costly sacrifice! For practical use, it may be helpful to know that myrrh is great for many body systems, oxygenates body tissue, elevates mood, and helps manage stress and frustration. The Egyptians were known to use myrrh from birth to death (it was part of the embalming fluid), and they found it helpful for relief from the desert heat. Today, myrrh is often used in oral hygiene products and a variety of perfumes. So, do you use frankincense and myrrh in your home? I have found mixing frankincense, myrrh, and rose oil to be a wonderful addition to my skincare routine (and feel free to try geranium as a cheaper alternative to rose)! But however you use them, using truly pure, carefully distilled essential oils can be a wonderful blessing in your home. What’s your favorite use for frankincense or myrrh? Comment or reply to let me know! I’d love to hear from you. Are you not yet using essential oils? Now is the time to start! Go here and choose a set of oils (includes frankincense! ); feel free to add myrrh or any others you’d like to try and you’ll get the wholesale price of 24% off! I’d love to help transform your home with pure essential oils and other non-toxic products. The info presented here is from personal experience, Healing Oils of the Bible, and The Essential Oil Desk Reference. Nothing here is presented as medical advice. If you are interested in using frankincense or other oils medically, you may find helpful articles on http://www.pubmed.gov, a peer-reviewed government website. This site utilizes referral links. This means we may receive a small compensation when you purchase through links above, but we only include items we use and love in our own home! Thanks for your support of this site.